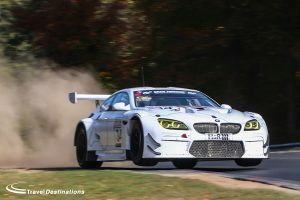 An intro to David Pittard, 2019 and the VLN! Hi! Welcome to the first iteration of my 2019 blog! 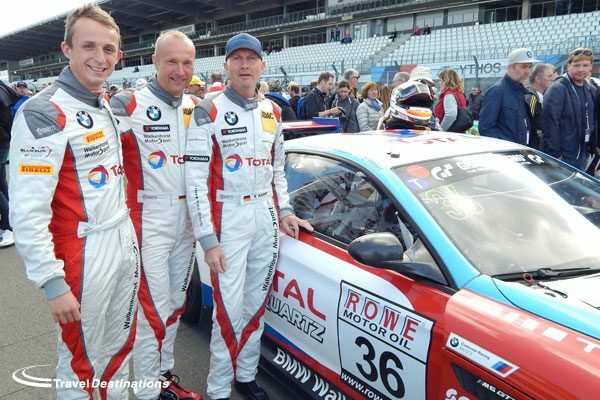 I hope to give you an insight to my busy 2019 season as a racing driver Racing across Europe with BMW Motorsport and Walkenhorst Motorsport piloting their BMW M6 GT3 car in some of the world’s most competitive races! I have been a long term fan of Travel Destinations, and thought I could hopefully engage with the fans of Travel Destinations as I did at the Spa 6hrs last year. To give you an extra insight of behind the scenes, in the world of sportscar racing and motorsport in general, for a racing driver. Most importantly answer your questions and write about what you want to hear! Firstly, I’d like to thank Travel Destinations for having me write this blog for the 2019 season, and to start I thought I’d give you a quick background on why you should listen to me in the first place! I’m 27 years old, from Hertfordshire in England, and I am very lucky to have been racing for 19 years. I started karting when I was 8 at my local indoor kart track, before going MSA racing in Rotax for 8 years competing at club, national and international level before making the switch to cars in 2010. I won the Britcar British Endurance Championship driving a Porsche, before getting on the Ginetta ladder starting in their GT5 challenge, before finishing runner up in the 2014 GT4 Supercup and 3rd in the 2017 British GT4 Championship. 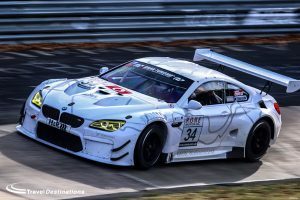 For the past 12 months I have been racing at the Nürburgring Nordschleife with Walkenhorst Motorsport and claimed my first pole position in my 3rd race meeting in a GT3 car and I am currently signed to Walkenhorst for the next 2 years to race in the VLN and the Spa24hrs which is hugely exciting opportunity for my career! 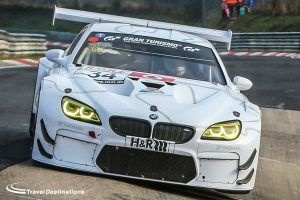 My medium term aims are to drive for BMW Motorsport in their GT car program, and long term I want to win the 4 big 24hr races in the world, Le Mans, Spa, Nürburgring and Daytona! So there, that is me, the year is set to be a big one for the Walkenhorst team! The “little” team from Melle Germany. Off the back of their Spa 24hrs victory, it’s taking on the best in the world in the Blancpain Intercontinental GT Series representing the BMW brand. 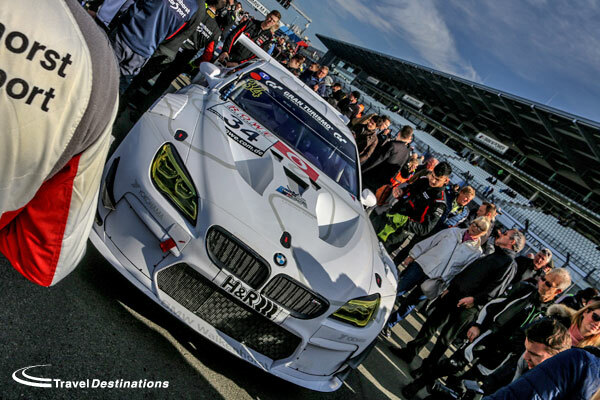 As well as the big European GT3 24hr races and the full VLN series with 6 cars! At the time of writing not all the line ups are announced so make sure you stay tuned to the Walkenhorst social media channels for the announcements ;). All I will say is that they are very international. Exciting! The reason for partnering with Travel Destinations, is because of the events that they run and attend. Many of the races I have mentioned in my introduction have packages organised by Travel Destinations. I’m a MASSIVE motor racing fan, these are all the events I have/want to attend/follow closely. Hopefully I can add some insight into these events as part of this blog series to help you choose which events to attend. I hope to see you at the events themselves to add to your experience! So please email in any questions and I hope to answer them in the next blog! Another reason for partnering Travel Destinations is I believe I can add an event to their already busy and varied schedule…. One of Germany’s hidden treasures of the motorsport world… the Veranstaltergemeinschaft Langstreckenpokal Nürburgring (VLN)! For 42 years, the championship has been competing on the “North-Loop” of the Nürburgring. It is like no other championship that I have ever experienced, at a track like no other in the world! Where else in the world can you find grids of 150+ cars, works manufacture teams and drivers driving the latest and fastest GT cars in the world at the front of the grid. All the way down to home-built cars with club racers driving for fun and to not be beaten by the circuit. It is a national championship but attracts drivers from all corners of the globe! 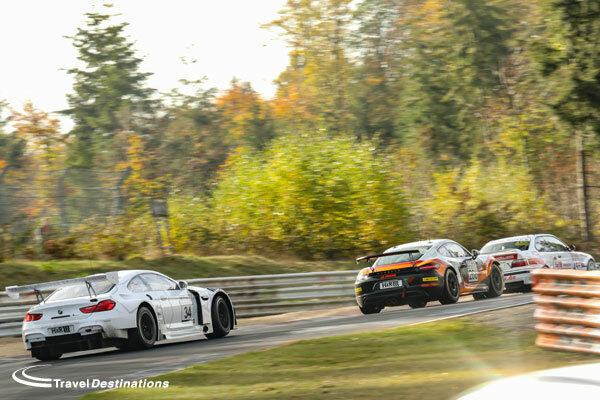 That is the magic of the VLN! The race weekend is very fast and furious, with the “taxi session” starting on the Friday afternoon at 16:00-18:00. This is basically 2 hours of pre event practice however it is allowed to bolt in a passenger seat to any of the race cars and take guests around the track during the practice session with all 150+ race cars testing for the race! It is the closest you can get to being in a race without a race license I am sure, and something that isn’t done anywhere else! Make sure to be at the track before 15:00 where I can give you an in-depth tour to see the cars up close in the Walkenhorst garage! The Walkenhorst team I race with run a BMW M240i CUP5 race car as their taxi, which is a brilliant mix of speed sitting in the “middle of the race”. You are constantly overtaking Clio Cup cars and some slower Porsches and being over taken by Ferrari Challenge cars and our very own BMW M6 GT3 car. 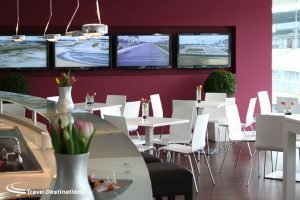 To give an adrenaline filled experience of the full Nürburgring GP circuit and Nordschleife combined! After the taxi session is finished I will debrief with the team and work out a plan for race day. Go to the drivers briefing to make sure I understand all the rules and regulations for driving in the VLN. Then there is time to get some food onboard and an early night! However, for spectators, it is a great opportunity to visit the motorsport themed restaurants around the Ring (The famous Pistenklaus, the Sabine Schmitz family owner restaurant is a must), sink some local Bitburger and talk cars for the evening! 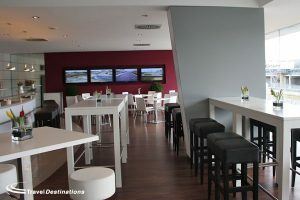 Race day is an early start with the Walkenhorst Hospitality Lounge overlooking the start and finish line on the GP track, opening at 07:00, which will be your base for the day. The track is opened at 08:20, but with qualifying actually starting at 08:30 (to stop a massive bundle to the beginning of the pitlane to get the free track!). Every driver must complete 1 lap to qualify for the race. Qualifying is a good time to walk around to different areas on the GP circuit to pick your favourite car to support in the race (apart from the Walkenhorst cars), however at 09:45 you should turn your attention to the live timing app where it all gets interesting! In the final 10-15mins most of the cars are parked in the garages, all qualified and ready to be prepped for the race. Some cars are then sent out on new tyres with the fastest drivers installed to determine the final starting order for the 4hour race! Watch the screen turn green and purple as the less busy track allows the drivers to put in their fastest lap times! After qualifying is finished at 10:00 there is little time for the teams to lose as the race starts at 12:00 but with a 20min warm up lap and public gridwalk, the cars need to be readied for the grid by 11:20. This doesn’t leave much time for drivers and teams to prep for the race. During this time the Pitlane is opened to the public to view the cars up close being prepped and rolling out of the garages to make their way to the grid. After the Walkenhorst cars have all left the garage you will be escorted to the gridwalk to see the cars and feel the buzz of excited nerves from the teams and drivers just moments before they ready to do battle with each other and the infamous Nürburgring Nordschleife! Watch the start of the race from either the hospitality suite, or the Turn 1 grandstand as you watch up to 60 cars taking the start of the four-hour race. After that you will be guided to key points on the Nordschlife to spectate and see the cars and drivers doing battle. The famous YouTube corner (Brunchen) or all the way round to almost look directly into the drivers cockpits through the side window as they rattle through the Karosell at nearly a 45degree angle! Keep upto date with the race via the Travel Destinations Whatsapp group which will feed information to your phones about what is happening in the race! After seeing the wild Nordschleife, you then return to the GP circuit for the final 30mins of the race. Watch the finish from the hospitality suite, watch the victors spray champagne on the podium as race day comes to a close. I will meet with you after the race to share a beer and give you a full run down on the race from my and the teams perspective! So now you’ve watched the track and the racing, you’ve experienced the track from the passenger seat in the taxi session, now it’s time for you to drive the track yourself. Complete your Nürburgring experience! The track is available for Tourist Driving on the Sunday from 08:00 – 19:00 for you to experience, from behind the wheel, the Green Hell! I love the VLN. Its accessibility, its variety, its uniqueness, and something that can be comfortably completed in an enjoyable three days away from home! There is nothing quite like this event in the world and with Travel Destinations it is the best way to make your pilgrimage to this Motorsport mecca! 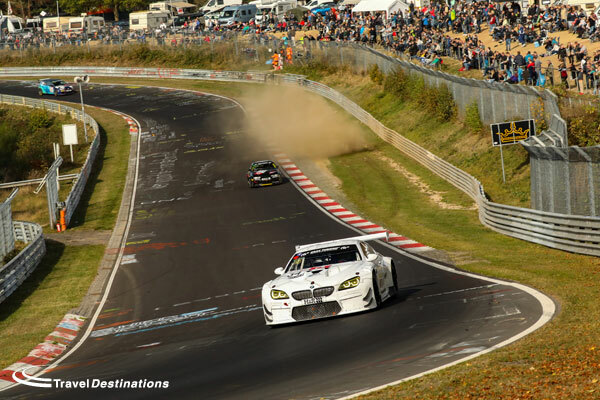 For details of our travel package to the final round of the 2019 VLN race weekend, then please click this link VLN Endurance Championship for more information. If you have questions or wish to book then do give us a call on 01707 329 988.